The location was excellent - an easy walk into town, but a quiet spot to retreat to. We loved everything. Hospitality was fantastic, the place was beautiful, the bed was comfortable, location was great and view was stunning. The property was simply beautiful! Very very clean and spacious, picturesque views of the Caldera, gorgeous winding paths for walks and the owner Giorgos was the best feature!! He is very hospitable, friendly and went out of his way to make us feel comfortable. My companion had hurt her ankle a week before which did not stop her from going and Gio tried to accomodate us in order to ease access for her ( lots of steps everyewhere which is no one's fault!) and it is better to rent a car or ATV to get around and see the whole island which again Gio helped with! Do not even think about it! Go there! We had an amazing experience with the hospitality from George and Albert and luxury and comfort of the cave suite. The breakfasts were delicious and served on the balcony overlooking the sea and caldera. 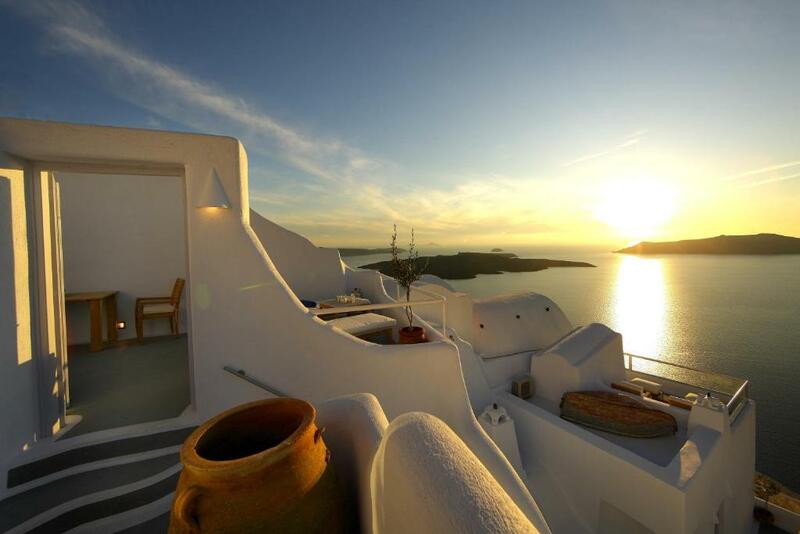 We would love to return when we find ourselves in Santorini again. Wonderful place and super friendly staffs. The villa is located at a private and silent area, which is near by the three bells church, 5-10 minutes to the main street. The villa is facing sea view and not so many stairs! We had a great great time in ikastikies suit. Super recommend! Everything. The place is amazing! Great location. Great, and attentive staff. Incredible breakfasts served to our rooms, or on our patios. Ebertrhong was perfect and we were sorry to have to leave! Highly recommend!!! Everything! From the hospitality, the friendly staff, the breakfast, the view and the location. It was all amazing! Очень красивый отель с местным колоритом! Чудесный персонал, особенно хочется отметить Альберта, который всегда был готов помочь. У моей мамы был День рождения и она получила в качестве подарка очень вкусный торт. Было очень трогательно .Хочется сказать огромное спасибо всем работникам отеля! Мы провели великолепную неделю! Расположение отеля тоже заслуживает особого внимания. Очень красивое место с чудестным видом на кальдеру в самом центре Фиростефани. Вообщем, только комплименты! Lock in a great price for Ikastikies Suites – rated 9.7 by recent guests! 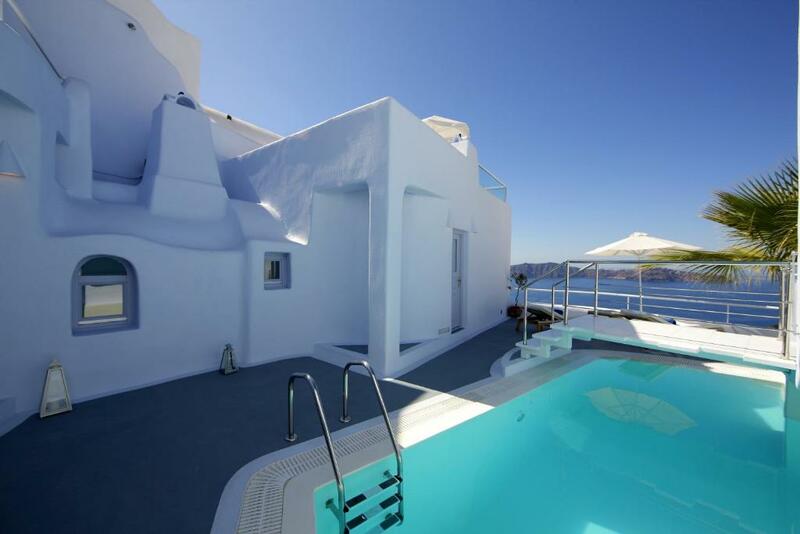 Boasting an outdoor pool and located in Firostefani village, Ikastikies Suites is a complex of Cycladic-style accommodations overlooking the Caldera from their balcony or patio. Free Wi-Fi is available in all units. 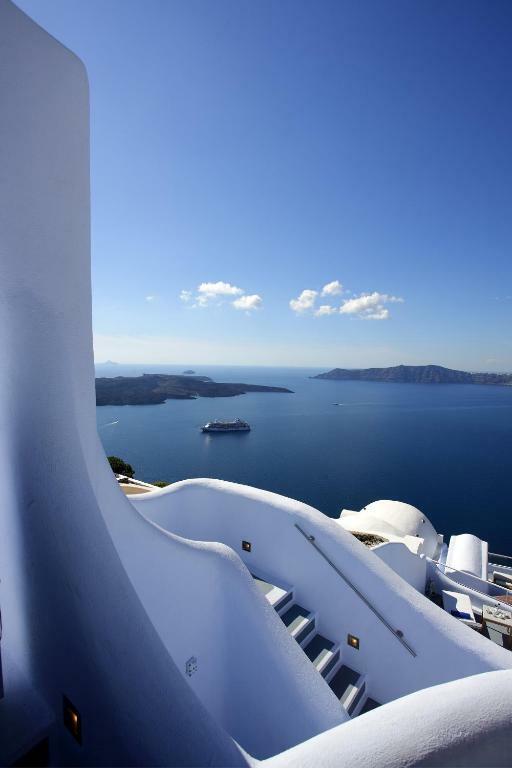 Fira center is a 10-minute drive away. 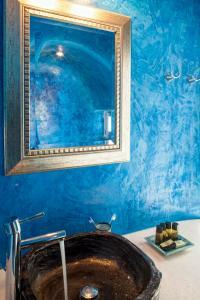 Featuring whitewashed walls, all suites at Ikastikies are tastefully decorated in shades of blue, green and orange. 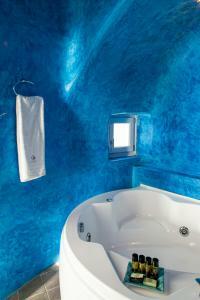 Fitted with a hot tub, each includes a seating area with flat-screen, satellite TV and CD/DVD player. 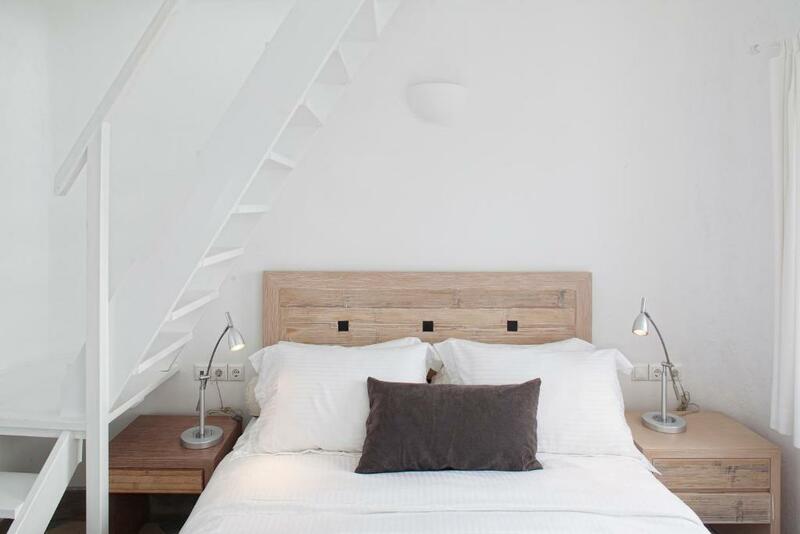 A kitchenette and a mini-bar are also provided. Guests can enjoy a daily breakfast in their suite. A tour desk is available in the premises. The property can also assist with car and bicycle rentals. Santorini Port can be reached in 6.2 mi and Santorini Airport lies within 5 mi. Free public parking is available nearby. 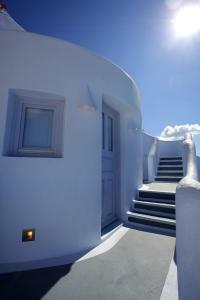 When would you like to stay at Ikastikies Suites? Spacious and stylishly decorated suite is fitted with curved walls. It features a kitchenette and a colorful bathroom with spa bath or shower. This spacious suite features a private pool with terrace and offers views of the Aegean Sea and the volcano. House Rules Ikastikies Suites takes special requests – add in the next step! Ikastikies Suites accepts these cards and reserves the right to temporarily hold an amount prior to arrival. The rain - no one is to blame for that! Everything about this property is amazing. George, Albert and Alex were fantastic and went above and beyond to make the stay comfortable. They arranged all of our dinner reservations around the island and organized taxis to and from. The location is perfect, out of the cruise ship madness of Fira but still within walking distance to both Fira and Imerovigili. 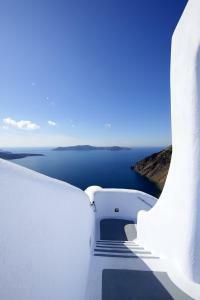 The walk to Oia is also a must do, but more of a commitment. Our favorite part had to have been the breakfasts. When we checked in, we asked about breakfast and George replied, "we'll bring it to you." For the rest of the week, they noticed when we were up and about and brought down a huge breakfast spread. Sometimes we ate in our room, sometimes on the terrace. Fresh cooked eggs, meats, cheeses, greek pastries, greek yogurt, fresh honey, breads, orange juice and coffee. I'm hungry writing about the breakfast. 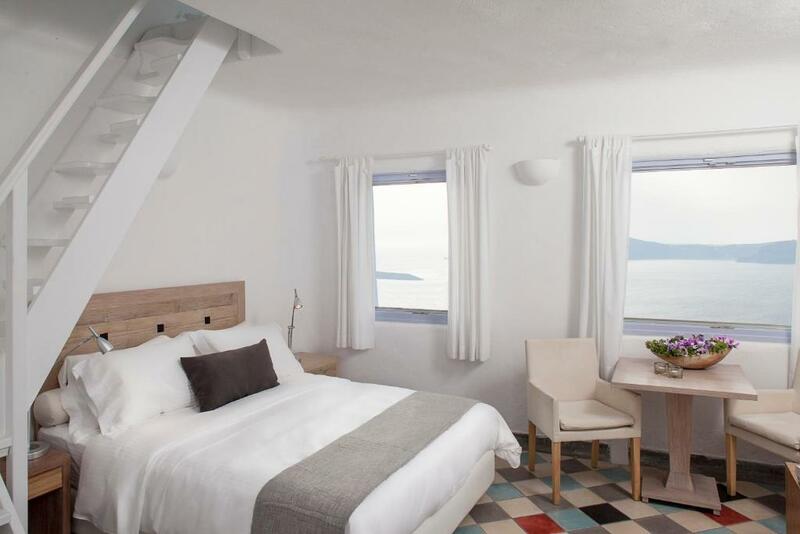 The rooms are pristine and have AC, but we opted for windows open to the Aegean breeze most nights. Terrace is great for sunning, reading, swimming. 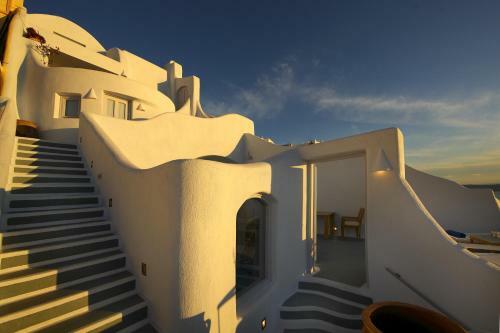 This is the town you want to stay in and the hotel you want to be at in Santorini. It's built into the side of a cliff so be prepared for lots of steps!